LAS VEGAS (AP) — A jury in Las Vegas flatly rejected former U.S. Sen. Harry Reid’s lawsuit against an exercise band maker he blamed for injuries — including blindness in one eye — he suffered when the stretchy device slipped from his grasp and he fell face-first a little more than four years ago. Jurors never saw the actual device because Reid’s adult son, attorney Leif Reid, disposed of it soon after Harry Reid was injured. Reid and his wife, Landra Gould, weren’t in the courtroom when the verdict was read. The 79-year-old former Democratic Party leader used a wheelchair throughout the two-week trial, following treatment for pancreatic cancer and back surgery. Their lawyer, James Wilkes II of Tampa, Florida, said he respected the Nevada jury’s decision. “I may not agree with the outcome, but I agree with the way we got there,” Wilkes said. Reid’s attorneys dropped a negligence claim after several days of testimony that began March 27. Reid, the Democratic Party leader in the Senate when President Barack Obama was in the White House, testified he wanted Senators and voters to know he wasn’t incapacitated. 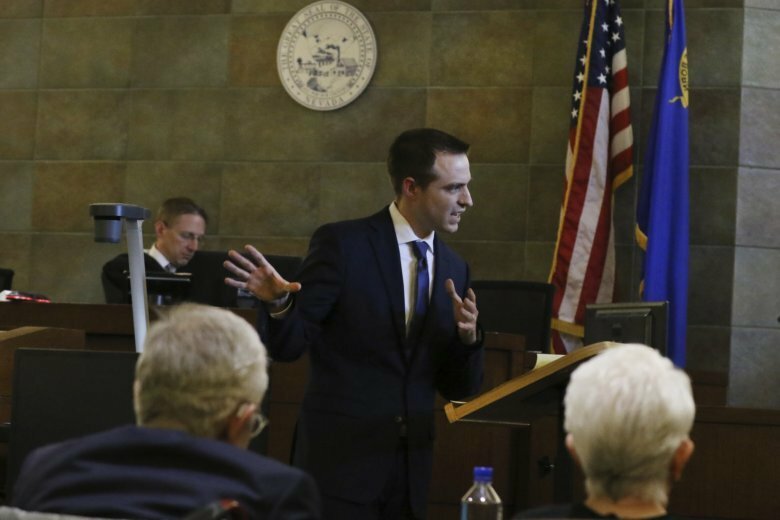 Quiat reminded jurors during closing arguments on Friday that they would never know for sure if the device Reid was using was made by Hygenic. The company attorney also raised questions about Reid’s truthfulness.